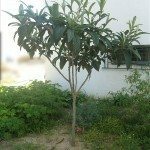 My loquat tree is very healthy, about 15 years old, but has never bloomed despite many mild winters. Why? It may be a fertilizing issue, likely a nitrogen/phosphorus imbalance. Too much nitrogen in the soil will produce healthy growth but limit flowering and fruiting production. Try adding some more phosphorus-rich fertilizer or bone meal to the soil to encourage more flowering and subsequent fruiting.